As spring creeps into the air bringing us sunny days and city streets filled with New Yorkers coming out of vitamin D deprived hibernation, an increasing number of days call out for adventure. The city’s inherent claustrophobia is relieved just a little with the sun illuminating the surrounding concrete and sending life into even the most lifeless corners of the over-constructed island. Every day that spring graces us with these signs of life feels like a day to celebrate, especially when one is soaking up one’s final days of spring break. Rare is the occasion that I am in the city with no duty to be done and with free reign over my time to re-discover the city as I please, and I was determined to soak the situation up as much as possible. In those final days of spring break in the city I walked for hours on end winding my way upward through the many neighborhoods of Downtown going wherever my feet felt like exploring, hitting some of my favorite blocks and finding sunlight strips on the fringes I had never happened upon before. Surprisingly enough, one such unexplored area happened to be over in the East Village, a neighborhood I previously thought myself familiar with. But after a wander through the East single digits I found myself in an area completely unfamiliar to me. As I was gazing at the unfamiliar storefronts of these blocks, I found one with a familiar name. Dun-Well Doughnuts, nestled inconspicuously amongst the bubble tea shops and Middle Eastern fair that proliferates throughout the neighborhood, was a doughnut shop that had come up often in my research. 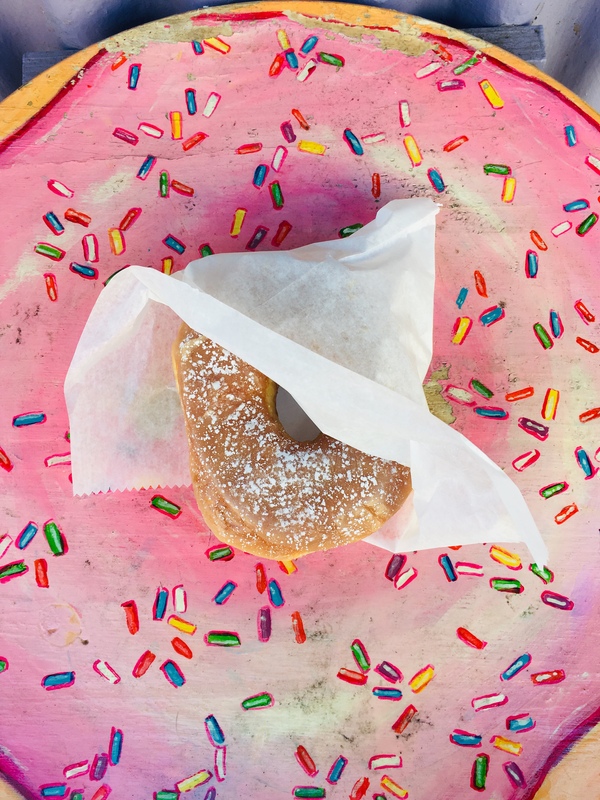 This little business with its origins in Brooklyn has made a name for itself in the New York doughnut scene not only because of their supposed variety of well-executed flavors, but also because of their vegan nature. Yes, I once again found myself at a vegan bakery, and another one with doughnuts no less. But these were not cake doughnuts like the ones at Erin McKenna’s. These were the real, yeasted thing. I did not enter upon my first walk by, as I had just eaten a killer breakfast bagel from Black Seed Bagels and was not sure if doughnuts were the sweet treat direction my day was headed in. But as I continued to walk about, I kept thinking of the quaint storefront and I found myself walking back down for some doughnuts. A single employee was behind the counter calmly awaiting the small clamor of customers that happened to enter at the same time as me. A person next to me asked which flavor she recommended, and I was in luck when she said the two flavors I was looking at: maple, and peanut butter and jelly. When I made this my order I was asked if I wanted chocolate drizzle on the peanut butter and jelly, which took me off guard. While peanut butter is a classic partner for both jelly and chocolate, I would not think to add one to the party hosted by another. For this reason I said no, wanting to only taste the flavors I came for without distraction. With doughnuts in hand and no sitting room left in the small parlor I settled outside and rested on one of their cute doughnut-painted counters to inspect my goods. While both of these doughnuts were puffy, they were smaller than the artisanal doughnuts I had been having of late. Each one could easily be grasped in one hand and there was not a mountain of height to bite around. However, I was not disappointed by this because that meant two doughnuts, which was the amount I was gonna be getting anyway, would be less wild than if they were the pillowy giants I was used to. Rather they were cute miniature pillow-ettes. I began with the maple, thinking it wise to start with the single flavor before moving onto the double team with filling. I went in for my signature pre-bite sniff, and was not met with a light maple scent, giving me hope for a well mapled doughnut. Yet when I got a taste there was hardly any maple to be found. The granular glaze left not only an imperfect mouthfeel, but a flavor more like a basic glaze than anything. This was coupled with a dough that was airy, not only in the lightness of what was there but also the abundance of air within the actual doughnut. When I examined the texture after a bite there seemed to be heaps of air unevenly pumped into the layers. Altogether, this left a doughnut that was good enough to finish, but extremely basic, missing the mark on its attempted flavor. 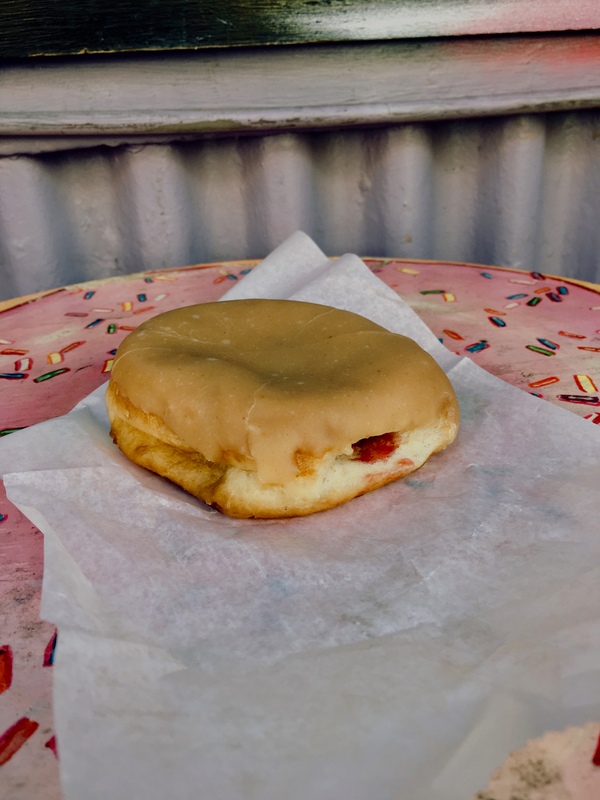 I had more hope for the peanut butter and jelly-filled doughnut, as jelly is difficult to make flavorless and the filling would perhaps fill the airy gaps that were abundant in the other one. On these two accounts I was correct, as the raspberry jelly was just the right mix of tangy and sweet cutting through with the brightness I was looking for from the filling. However, this flavor too found its way back to more of a classic doughnut, as it was more like eating a regular jelly doughnut than one with the addition of peanut butter. The thin peanut butter glaze on top was not nearly enough to create any balance with the strength of the jelly, and the nostalgic flavor combo I was looking for was lost. Now of course, there is the vegan factor to consider. And for vegan yeasted doughnuts these were surprisingly good when it came to texture. While they were extremely light, the basic idea was there, and it could certainly stand up to any Dunkin’ doughnut on that front. But there was a lot lacking on the flavor front. While nothing was off-putting, that was because there was nothing really there to cause a reaction of any kind. I was really surprised by how bland the dough itself was in both flavors, no sweet, salty, savoriness that seemed to have been even attempted. They could have possibly gotten away with this if there was much brought to the table with the glazes, yet there seemed to have been trepidation on this front as well. So, when examining this purely as vegan options, it’ll do the job if you’re really looking for that classic texture, but I would also bet there are better options on this great island that also try for some exuberant flavors as well. While these were not the most stellar doughnuts, they did not detract from my joy as I continued my stroll back down home to FiDi by way of the western waterfront. For the most part, a doughnut in hand is a doughnut in hand, and I was grateful for the adventure my wandering back to Dun-Well provided. I don’t think I’ll be heading back soon, but I’ll certainly be looking for days like the one I found it in as the sun shows its face more and more.